Should you hire Thomas Haynes Photography to do your images, shown here is the basic kit needed to do the job. 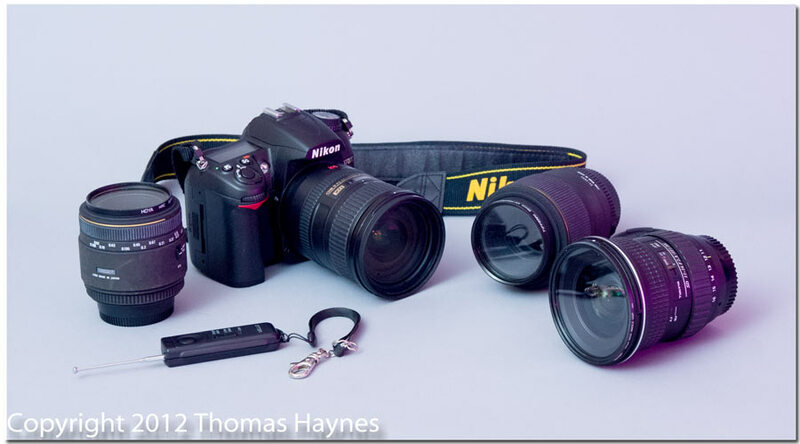 The camera in the photo below is a Nikon DSLR (digital single lens reflex). We use more than one camera but this is the overall workhorse for most photos. This particular camera is about 18.5 to 20.5 megapixels (MP) in raw format and about 9.5MP .jpg photos with the least compression from the camera. RAW files are simply the full file of digital data for an image with no editing by the camera. RAW files allow more detail to be retrained in the photo but also require special computer software to "develop" the photo from the camera data. Many real estate photographers and almost all individual photographers use .jpg, a small and compressed kind of image file with less complicated editing needed to make the photo usable. Too often, we see business photos ( such as property or home) taken apparently with a small point and shoot camera, or cell phone, posted to Internet listing with no editing done...what is in the camera is what goes on the listing! These are generally the "not so good" photos you will see. For critical accuracy, pros and advanced amateurs use RAW to glean the most from the image captured by the camera sensor. For speed in editing a large number of photographs such as from covering an event, .jpeg may be used depending on the photographers needs in that assignment. To do professional quality photos for both personal and and commercial assignments, a good camera is needed but it does not need to be the most expensive out there or the largest. Generally, the largest image used from a real estate listing may be for the cover of a magazine such as "Homes and Land", a sales magazine published to show available properties in specific regions. For personal and commercial photos which will be printed for display in a booklet or on a wall, a camera like we show here does well and a fine quality print of perhaps 30 inches x 4o inches is quite possible. A good choice of lenses is vital. The lens choice depends on the photo session intent and location. Portraits will use often a 50mm lens or to flatten the field a 105mm may be used. This applies to portraits with a backdrop or photos modeled outside. We use a zoom lens with 18mm to 200mm reach for most outdoor and pet/animal photos. For tight areas a wide angle lens is necessary: The wide angle lens we use is the Tokina 11-16mm f/2.8(far right above), a lens able to take photos in low light if need be and with a well designed wide angle function. You can imagine the need for wide angle in some interior photos of buildings or even for a large landscape or group shot. We will tell later in a dedicated blog post about using a wide angle lens because even with discretion and trained use, there will be some distortion in photos of tight areas. The first corrections are by the photographer when the photos are taken, using the camera in a way for least distortion. The final photo is refined further with specialized computer software. The best wide angle photos are a result of proper photography in the first place followed with skilled editing time at the computer. 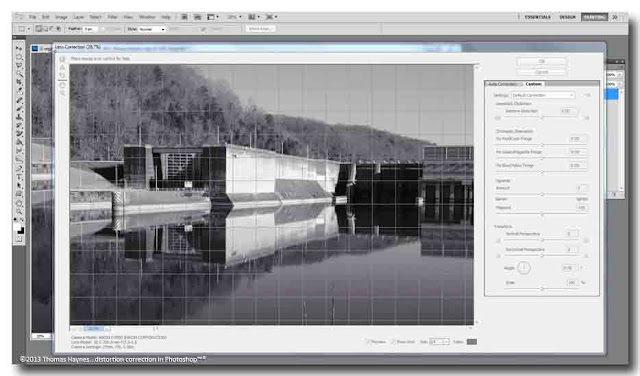 This image is a screen shot of a photograph in the distortion correction module in Photoshop™. Regardless of how easy tv advertising makes it look, properly editing photographs and correcting things such as crooked walls and distorted buildings is work and requires knowledge and skill to do well.. Software such as this is used with interior wide angle photographs. Close up or "macro" photos use the lenses at the far left and second from the right. These lenses capture a dragonfly or small toy with great detail and accuracy. For small items such as jewelry or toy soldiers for eBay sales or personal records, these lenses excel. Note, these are the same lenses mentioned for portrait use, rendering clean and pleasing controlled depth of focus to the photos. The left one is 50mm, f/2.8 and the one second from right is 105mm, f/2.8. The little device with a lanyard is a remote control trigger for the camera shutter. Sometimes the camera needs to be where the photographer is not or cannot be, such as high in the air on a pole above the working crew. Not needed often, nothing will takes its place for good work when a remote photo is called for in the job at hand. Will the color be accurate? Indeed it will. The computer is calibrated every 2 weeks to assure what is seen is what the printing company will print. Obviously, a print is not as bright as a computer view. The computer is a lighted view, transmitted light. A print relies on reflected light and will not have the brightness of a monitor. This is a color chart used to insure colors in edited photos are accurate and consistent. 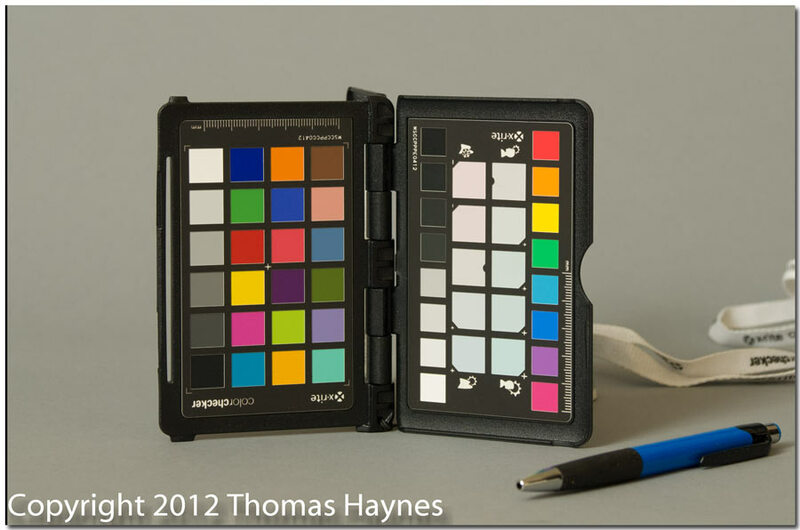 Combining this "Color Checker™" by Xrite with a color managed computer is essential in getting color right. For printing, correct color is imperative. For Internet, we have no control how accurate the colors may be displayed on someone elses monitor screen but we do know the colors we uploaded were on spot. Using the accurate calibrated color sample chart, a "profile" is created for a particular location. This color reading for the photo scene combined with the calibrated computer color will maintain consistent accurate color from a photo session. A different profile may be recorded for interior, exterior and oddly lit subject matter. When needed, small strobe lights and other light sources are put to use. The idea is to come as close to natural as possible for the photographs being done. 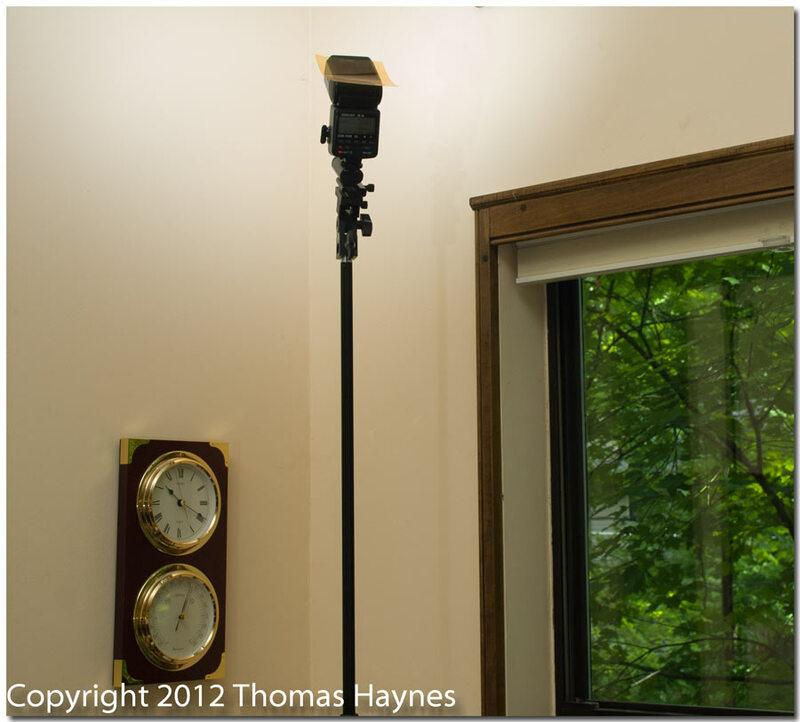 In this example, a small off-camera strobe light is used with a light stand to "bounce" diffused light into a room. With skilled adjustment of light, the room is neatly and clearly lit in a natural manner. Why not just use the lights already in the room and daylight coming through the windows? That is a good question and here is the answer: Unless very close to sundown, exterior natural light will be brighter than light in the room even with the room lamps turned on. When the camera exposure is adjusted to have enough light in the photo of the room, the room lights look overly bright and the window light...well, go look at a few real estate listings to see what we are talking about. The windows are generally "blown out", a term photogs use to say overexposed. Windows will often be glaring white and totally overexposed. When small supplemental lights may be used to give the best results, that is exactly what we do. Notice how the room is lit(even if facing the flash just to show it in action) and the outside view is apparent and not a simple blast of overexposed white glare. Of course, care was taken to select where the strobe flash was placed and how bright it was set to light the room naturally. The photographer would be off to the side or with the flash to his or her back and the final photo would not tell any tale of the flash ever having been there! Consider us to do your photography. Please contact us for a speedy response. We welcome thoughts and shares from clients and photographers. Contact us and we may post your contribution with credit to you as desired. Describe Site Analysis, general Side note: staging adequate or recommend? Daylight: suitable? come back needed? Describe what we look for in lighting. First on site edit: Basic check of all shots taken; all necessities and highlights included? Items of special appeal noted and photographed? Agent emphasis? 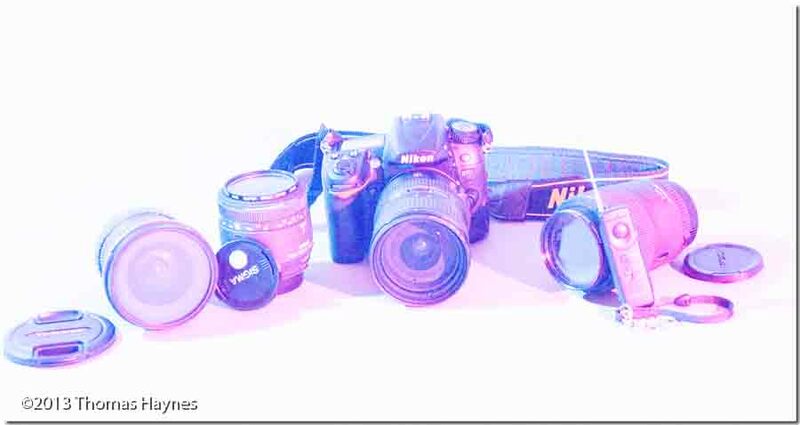 Ask any question you want about our equipment or how you may take better photographs. The contact form at the right side of main page means we are only and e-mail away. Very helpful article. There are only so many still lifes of our desk you can take so if you,re serious about digital photography.